After discovering the Flipped Classroom, I was amazed at how I have never heard of this new age of teaching. To me, it looks awesome and gives me a few ideas for my UDL lesson plan. (Yahh!!) It is such a new way of teaching and definitely brings light into the classroom! 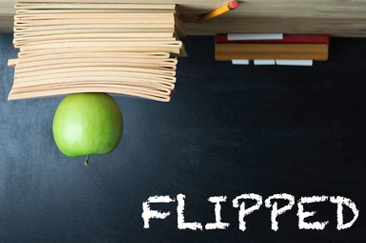 The article, “To Flip or Not to Flip” is such an informative article that easily explains what a Flipped Classroom is and what exactly it does for a class. The author, Jeff Dunn states that Flipping a classroom has brought his classroom back to life, so to speak. It is definitely something new and I can only imagine the enthusiasm students will get from this form of lesson. Below, Dunn refutes the argument from people who state that technology should not be overused in classrooms and makes it robotic like. To those who say that technology in education feels automated, I would argue the exact opposite. Using technology has brought the compassion back into my classroom, giving me time to hear from my students and to work with them one-on-one, getting to know them better as individuals. I personally would vote on ‘to flip.” However, it is not for every classroom. A teacher should decide upon this form of teaching judging upon his or her individual classroom. If a teacher decides to do this, then they have to be prepare their in-class lesson for more one-on-one learning. Anyway, the Flipped Classroom brightened my eyes to new resources for students and I am kind of excited to see if this will work for my future elementary classroom! Yah for learning new things! Great point. It is not for everyone. The biggest compliant I have heard is that teachers don’t know what to do with all their classroom activity time. This is a new planning aspect for some. Cell Phone Use in Classrooms? bdburke on High School Stinks….